A patient who is living with an aggressive and inoperable brain tumour has met scientists at Plymouth University who are working towards a cure for the devastating disease. 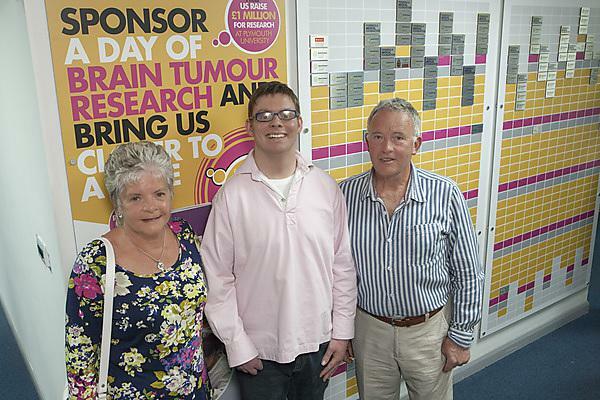 Luke Dustan, 29, who lives in South Molton, Devon, visited the Plymouth University Brain Tumour Research Centre of Excellence on Thursday 25th June. He is being treated as an outpatient at nearby Derriford Hospital for a grade 4 glioblastoma multiforme (GBM) brain tumour. A PhD student in neuropsychology at Cardiff, Luke first discovered he had a brain tumour in 2011 after a colleague in his university department conducted an MRI scan to see if they could find an explanation for his severe headaches and visual disturbances. Luke, who is currently undergoing chemotherapy every three weeks, was accompanied on the visit by his step-father Douglas Allen, 69, who lives in Plymouth and runs Aquanauts Dive Centre in the city's Vauxhall Street. They were able to see at first-hand the work at the centre where scientists are focusing on identification and understanding the mechanism that makes a cell become cancerous. The team is exploring ways in which to halt or reverse that mechanism. A key innovation will be testing new drugs in human primary cell cultures leading to innovative phase 0 trials. It is hoped this will be followed by adaptive phase II/III trials with the potential for making drug therapies available to patients safely and more quickly. The family presented Brain Tumour Research with a cheque for £750 raised at an event at The Lounge in Plymouth. The Wear A Hat Day party was one of hundreds of fundraising activities which took place across the South West in March as part of the charity's annual campaign. The research at the centre, plus three others in the Brain Tumour Research network, costs £1 million a year to run. These funds pay for the researcher team, support staff and scientific equipment.